Long after its incredible encounter with Pluto and its moons in 2015, the New Horizons spacecraft is continuing its journey deeper into the Kuiper Belt in the outer reaches of the Solar System. Mission scientists and engineers are now preparing for its next close flyby, of a smaller body called 2014 MU69, on Jan. 1, 2019. 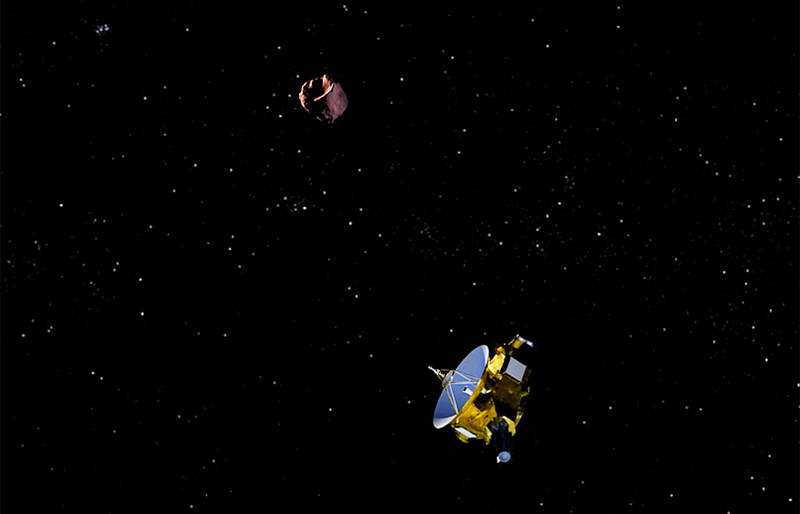 Along the way, New Horizons makes occasional slight course corrections to keep it on track, and now the spacecraft has just successfully completed its latest one. The gentle engine burn went according to plan, said NASA; the telemetry from the spacecraft reached the New Horizons mission operations center at the Johns Hopkins Applied Physics Laboratory (APL) in Laurel, Maryland, just after 1:15 p.m. EST. From New Horizons current location, it takes the radio signals more than five hours to reach Earth, from a distance of about 5.6 billion kilometres (3.5 billion miles). Pluto’s orbit, by comparison, ranges from 4.4-7.4 billion kilometres (2.73-4.6 billion miles). New Horizons’ thrusters fired, as planned, for only 44 seconds, which adjusted the velocity of the spacecraft by about 44 centimetres per second, a little less than one mile per hour. This was the first just adjustment performed since four similar ones in late 2015. These adjustments help to correct for refined measurements of 2014 MU69’s orbit from the Hubble Space Telescope since 2015. Besides the burn, the spacecraft has also now transitioned out of the “three-axis stabilized mode” that allowed New Horizons to make new telescopic observations of six other distant KBOs. Images will be sent back to Earth in the coming weeks, which will help to reveal more about their shapes, surface properties and any possible moons. New Horizons had previously taken images of another KBO, called 1994 JR1. 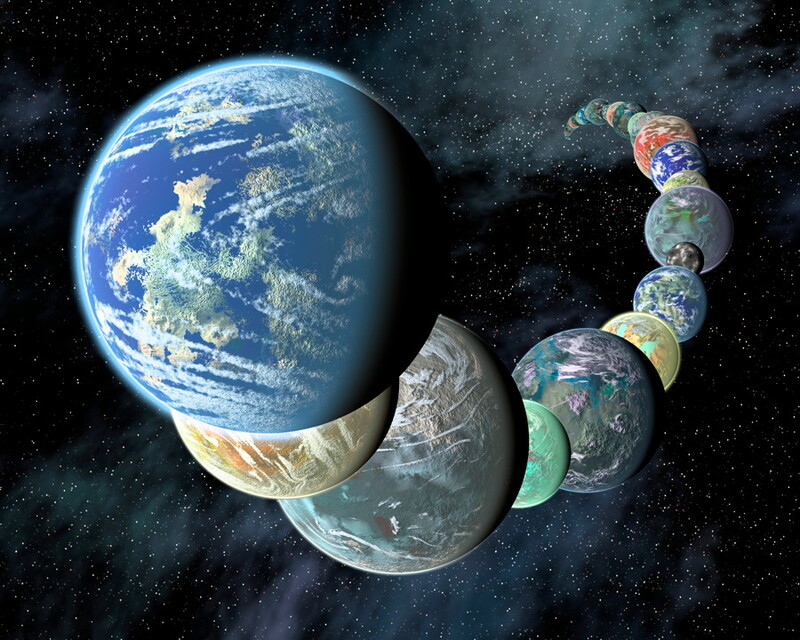 This KBO is only 145 kilometres (90 miles) wide. When the images were taken between April 7-8 last year, 1994 JR1 was about 111 million kilometres (69 million miles) away from the spacecraft. “Combining the November 2015 and April 2016 observations allows us to pinpoint the location of JR1 to within 1,000 kilometres (about 600 miles), far better than any small KBO,” said Simon Porter, a New Horizons science team member from Southwest Research Institute (SwRI) in Boulder, Colo. Also, being able to more accurately plot the orbit of 1994 JR1 allowed scientists to disprove a theory that it may be a quasi-moon of Pluto. 2014 MU69 is a small Kuiper Belt Object (KBO) much farther from the Sun than Pluto, some 6.4 billion kilometres (4 billion miles) away. It is much smaller than Pluto, only about 21-40 kilometres (13-25 miles) across. 2014 MU69 was first discovered in 2014 by the Hubble Space Telescope, as part of a search for other KBOs. During the flyby, New Horizons will pass at a distance of only about 3,000 kilometres (1,900 miles), much closer than its flyby of Pluto. Scientists are, of course, looking forward to this next encounter. 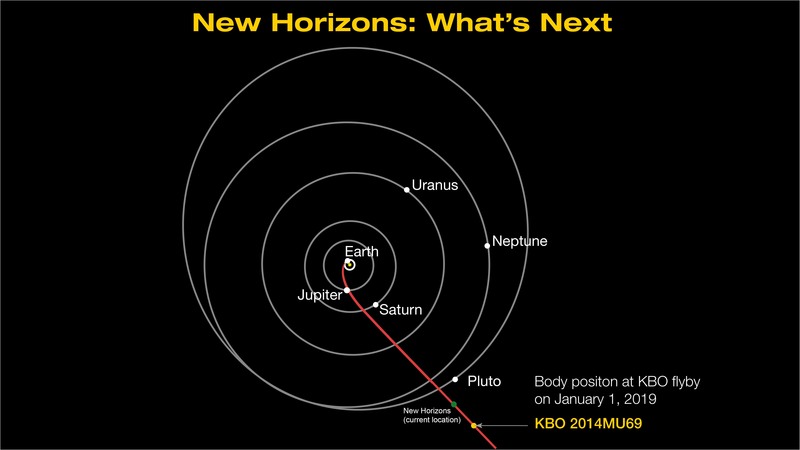 “Even as the New Horizon’s spacecraft speeds away from Pluto out into the Kuiper Belt, and the data from the exciting encounter with this new world is being streamed back to Earth, we are looking outward to the next destination for this intrepid explorer,” said John Grunsfeld, chief of the NASA Science Mission Directorate in Washington. Make distant flyby observations of about 20 other KBOs during 2016-2020, determining their shapes, satellite populations, and surface properties – something no other mission or ground-based telescope can. Make sensitive searches for rings around a wide variety of KBOs during 2016-2020. Conduct a heliospheric transect of the Kuiper Belt, making nearly continuous plasma, dust, and neutral gas observations from 2016 to 2021, when the spacecraft reaches 50 astronomical units (AU) from the Sun. Potentially conduct astrophysical cruise science in 2020 and 2021, after the MU69 flyby, if NASA desires. 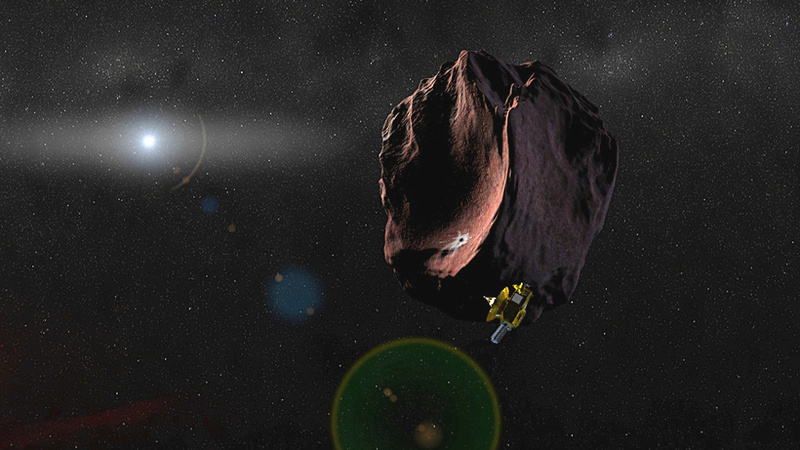 With KEM, New Horizons’ mission would be extended until at least 2021. Last October, New Horizons finished sending back all of the data from its Pluto flyby, over 50GB, which took over a year. New Horizons completely revolutionized our knowledge of Pluto and its five moons – worlds of bizarre and alien geological activity previously thought to be unlikely at best. With nitrogen ice glaciers, ancient nitrogen rivers, water ice mountains, possible ice volcanoes and a hazy atmosphere, Pluto is a wild place. Plus, both Pluto and its largest moon Charon probably have subsurface oceans, just like some other icy moons in the Solar System, although Charon’s is now frozen. Incredible, given how cold and distant they are from the Sun. The flyby of Pluto and its moons was an exciting event in planetary exploration, but there is still a lot of exploring left to do for New Horizons, which is now ready to continue its journey farther into the Kuiper Belt, a distant and remote region still unexplored – until now. (This article was first published on AmericaSpace).